I think I’ve mentioned before my (ever-so-slight) addiction to our website and blog stats. They just mesmerize me, though I’m still not quite sure why. I think it has something to do with the fact that I remain amazed at how the world is so intimately and instantly connected through the internet. Fascinating stuff. As I was looking the stats over, today’s point of particular interest is the fact that our highest trafficked areas of the site are not what I expected when we first launched. . .at all. What are most people interested in? Re-Purposing! I, frankly, am more than a little surprised. Not that I don’t find the topic enormously worthwhile, mind you: re-purposing is quite a passion of mine. But it’s surprising to see the overwhelming percentage of visitors who are drawn to that section of our site. The proportion is pretty staggering. And it seems to be growing! So, if you don’t know what it is, or haven’t jumped on the band wagon yet, this post is for you! I’m going to help define ‘re-purposing’ and try to exlpain the big draw. Instead of handing something in to a landfill or a recycling center to re-make into something else, re-purposing is simply using something for other than whatever it was first made for. It’s cost effective, ‘green’ and profoundly responsible. Plus, it often creates unique, one-of-a-kind pieces! Turning worn out clothing into quilts or rag rugs, for example, is a classic form of pioneer re-purposing. 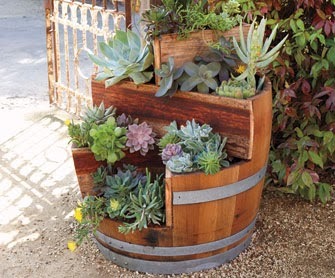 Modern day examples might be using old wine barrels for planters, old shutters for wall organizers and pallets for everything from headboards to wall hangings. Or, it could be as simple as turning a few odd antique door knobs into cute little coat hangers or carving old wine corks into sweet little stamps. It doesn’t really matter how big or small, how simple or complicated. . .it’s the idea that we use what we have instead of throwing things away that counts. “Use it up, wear it out, make it do, or do without” was a popular frugality motto through the Great Depression and WWII. But the concept has been around pretty much since the beginning of time. It’s really only in recent decades that we have become (sadly) a society that tends toward the disposable. So it’s encouraging to see the rising re-purposing movement. VERY encouraging. Jacqueline Lipsky made this beauty! Re-purposing SHOULD be born out of a sense of responsibility to our environment as well as our finances, and out of a respect for our possessions. But it needn’t be a boring, utilitarian exercise! No, indeed! It’s an opportunity to be wildly creative and artistic. . .looking at something from a different perspective and breathing new life into it. . .either aesthetic or practical! It’s an opportunity to let your inner kid loose and have some fun! Re-purposing is an ART! Our sister site “My Little Prairie Home” has a Pinterest Board that is FULL of awesome, creative, innovative and downright beautiful re-purposing ideas. . .but don’t let that be a definitive list. Instead, let it inspire you! Go forth and up-cycle! Note: Big thank you to Lisa Reichert for the use of her beautiful braided rag rug image! 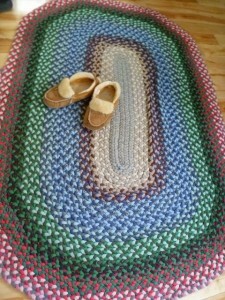 See her how-to blog post on making rag rugs here and visit her ADORABLE Etsy website. 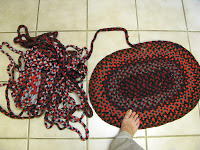 Also a big thanks to Jacqueline Lipsky for her gorgeous rag rug image! You can check out this wonder-woman’s blogs and items for sale. 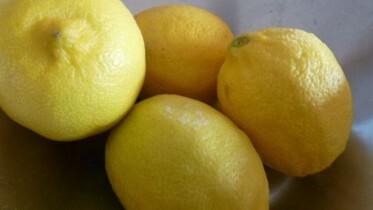 Be the first to comment on "The Beautiful Art of Re-Purposing"